Alongside staples like ankle boots and vintage denim, the leather jacket is one of those pieces we're pretty sure we'll always have in our closets. I'm not sure about you, but my leather jacket is the one piece I can throw on to make even a mediocre outfit look cool. There's no denying its overarching sartorial relevance, but even if you own and cherish yours, there's always a little room for new ways to style the classic. Just when we thought we were stuck wearing the same few outfits with our leather jackets, this season's offering is putting so many fresh ideas in our heads about how the jacket can fit into our current outfit rotation. Before you go any further, though, we should warn you that the following outfits show no traces of the typical moto jacket style you might be used to. Instead, brilliant colours, fun new styles, and unexpected textures are what have us excited to rethink our leather jackets. Ready to embrace all the new season has to offer? Not your average leather jacket outfit. We love how this look reimagines the classics. 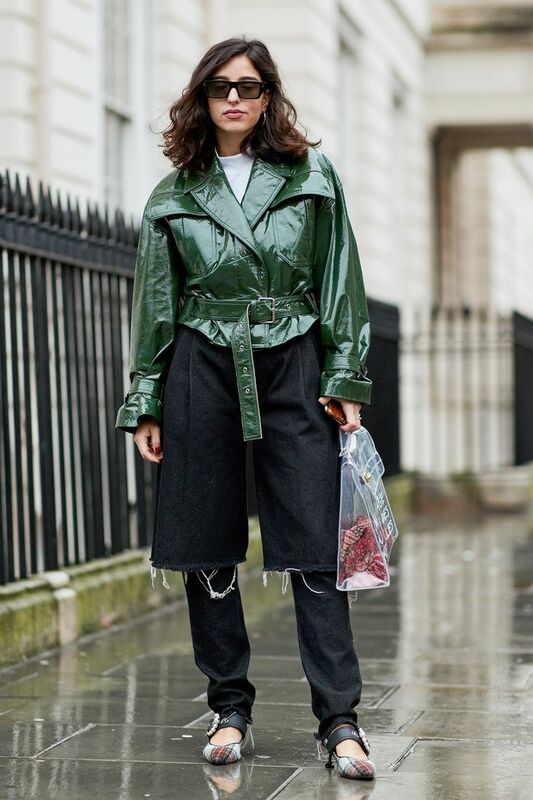 While cropped shapes are trending right now, there's something undeniably cool about how this oversize jacket goes down to meet her over-the-knee boots. The texture play in this look is A+. Layered over a velvet turtleneck, the jacket takes on a whole new life. The vinyl trench coat is one of the coolest pieces you can get your hands on right now. Unexpected colours are the calling card of this season's crop of leather jackets. Leave it to Alexa Chung to soften up an otherwise tough leather jacket. File under "how to dress on frigid days." A boxy, cropped shape is the number one jacket style for this autumn, as far as we're concerned. Behold a brand-new style phenomenon: the leather puffer coat. The trucker jacket shape creates a cool balance over a pretty floral dress. Try to resist this deep shade of blue, we dare you. Lean into the Western motifs with this studded jacket. Leather jackets are hardly immune to the season's opulent palette of pastels. One of our editor in chief's top picks of the season. The cropped shape gives this jacket a forward feel. We're suddenly questioning why all our jackets aren't this cosy. Not all leather jackets have to be so serious. This whimsical floral version makes us inexplicably happy. Available in sizes 36 to 38. Go for a subtly sporty vibe via drawstring closures. The aviator jacket is an underrated style, in our opinion. We're loving belted jackets this season. Between pretty colours and luxe finishes, this season's crop of leather jackets are putting a unique stamp on the style staple—and we can't wait to get in on the fun.